Newt revealed earlier this week he has more debts than cash on hand, and he is being forced to lay off about a third of his campaign’s full-time staff. His attempts to charge supporters $50 for a picture with him, and to make them “feel real good” for another $50, have done little to replenish his coffers. Many pundits feel the Gingrich campaign had some early momentum, but his negative campaign ads, arrogant attitude and increasingly bizarre behavior turned off voters. Once they started to realize what a self-serving little sociopath he was, their support dwindled. 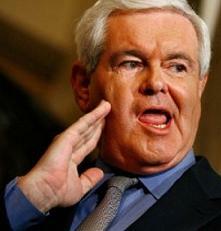 The Gingrich campaign has managed to come back from the dead twice during this cycle, but even plagues eventually end. If there is a God, the third time will not be a charm.